What is it and who is it for? 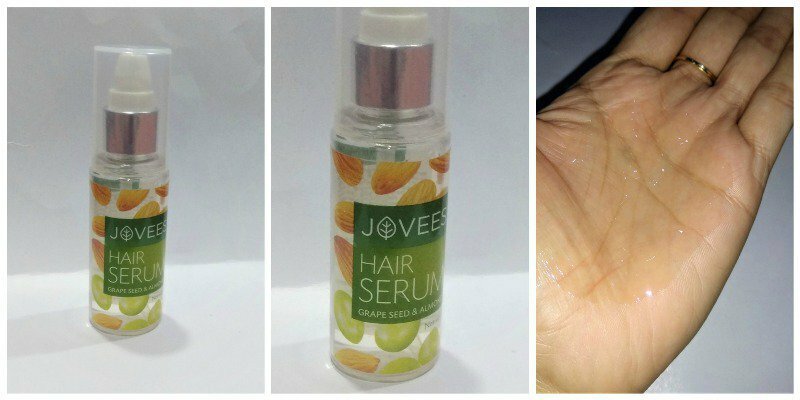 Jovees Grape Seed & Almond Hair Serum is meant for all hair types, this hair serum removes frizz, detangles the hair, leaving it soft and shiny. This hair serum comes in transparent plastic bottle packaging, with a pump dispenser. One needs to press the pump tightly to dispense the desired amount making it spill-proof. Dispense coin size amount of serum into your palm, rub vigorously and apply to the clean and wet hair. It absorbs quickly, keeping the hairs moisturized for good 6-7 hours. It has a gel based texture with medium consistency; as it’s not too runny so it’s easily manageable and easy to apply. This hair smoothening serum has a strong smell of almond which may not be liked by some, but not to worry as it fades away too soon. Randomly looking for hair serum made me land to this jovees product. What caught my attention were its natural ingredients like Almond, Grapeseed oil, Olive oil among many others. True to its claim, it is a non-sticky hair serum which adds shine and gloss to the hairs. Though one can use it daily, I use it only after the shampoo to my wet hairs, as my hairs tend to get oily too soon and applying serum to oily hairs is not a good idea. A small amount gives a good coverage to my medium length thick hair. I have frizzy hairs, so it smoothens the hair, making it manageable for a long time. If you have thin hair, you may want to skip this one as it will make the hair look much thinner. Stands true to its claim, I will recommend this product. BBlunt Hair Serum – Intense Moisture in Dry Summer ?